Andi’s lifetime ambition is to become a published author and the perfect opportunity lands with her, when she returns home to Callaway Cove. Her idol and renowned author Ford Delaney is looking for an intern to help him with his research, and Andi knows this is an opportunity of a lifetime. Ford Delaney is hiding in Calloway Cove away from the paparazzi and intrusion into his private life. He’s got a past that haunts him, and his attraction to Andi may very well be his downfall. But he is willing to help Andi achieve her goal, as he creates openings for her with his literary resources at his disposal. As Andi and Ford try to curb their growing desire for each other, the consequences of their actions seem to leave a deluge of broken relationships and pain behind them. As Ford’s past catches up with him, Andi finds herself fulfilling her life-long dream of becoming a published author, but alone and miserable and hoping one day Ford would come back to her. The plot is good, and the storyline is interesting. Lots of time I had to remember that Andi is only 21 years old, and her actions and reactions are of a young adult. Ford is the successful and arrogant guy hardened with life experiences, yet he is very protective of Andi. 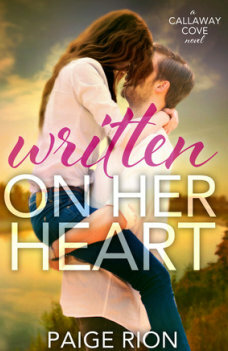 All in all, “Written On Her Heart” is a good one time read, and for a first time read of Paige Rion, it’s a decent book. Received an ARC from XPresso Tour Books via Netgalley for a honest review. « Shattered Witness – Captivating!